« I Love Rhubarb THIS MUCH! My sister-in-law Leigh and I are currently doing a nutritional cleanse called Isagenix. We drink shakes provided by the company for breakfast and lunch but prepare snacks and dinner ourselves. Naturally, we want to make the yummiest food possible in order to keep ourselves from feeling deprived. The chickpea dishes here are favorites among Isagenix users and are so tasty that I decided to prepare them on my TV spot yesterday on the program Mass Appeal. They made everyone in the television studio happy. I first learned to love chickpeas when I was a child living in India. They respond beautifully to spices and are also used to make gram flour, a staple of Indian cuisine used (among other things) in pakoras, wonderful vegetable fritters. 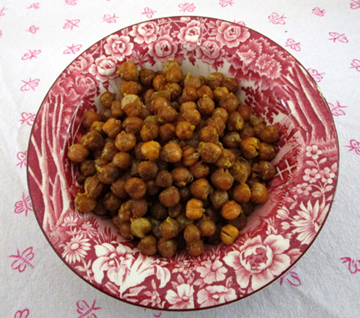 I can’t eat pakoras while cleansing, but I did put Indian spices on my roasted chickpeas. Thanks to Cuisinart for the mini-food processor that made the hummus a dream, and to Lodge for my wonderful pre-seasoned cast-iron pan. Preheat the oven to 400 degrees. Rinse the chickpeas thoroughly and then drain them well; then lay them between layers of dishtowels or paper towels to dry even more. If you have time, leave them to dry for a while longer, even overnight. Heat the pan; then add the olive oil. When the oil is heated, stir in the garlic, drained chickpeas, and salt. Remove the pan from the heat and make sure that the contents are well mixed; then place the pan in the oven. Bake for 20 to 25 minutes, stirring the chickpeas at the 10 and 20-minute marks. Be careful to avoid burning toward the end. Remove the chickpeas from the oven, and toss in the spices. Place the spiced chickpeas on paper towels to cool slightly; then eat them. If you don’t eat the chickpeas right away, they will lose their crunch, but they will still be tasty and nutritious. You may crisp them again in a 350-degree oven for 10 to 15 minutes if you wish. Place the ingredients in a small food processor and blend. (You may have to stop and stir them halfway through.) Taste to see whether the flavors please you, and adjust them if you they don’t. Try adding a little chili powder for extra spice. Refrigerate for 1 hour before eating with veggies or tortilla chips. If you can’t wait, it will still taste yummy. Makes about 1-1/2 cups hummus. And now the video. Please note that Ashley Kohl was a little overgenerous with the olive oil in the hummus. It was delicious but not terribly cleanse-ing…. This entry was posted on Thursday, June 11th, 2015 at 4:00 am	and is filed under Vegetables. You can follow any responses to this entry through the RSS 2.0 feed. You can leave a response, or trackback from your own site. 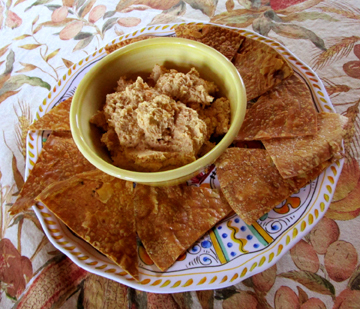 Fellow Kitchen Readers: Tinky came to dinner recently and brought her tahini-free hummus and the brown rice chips. I was skeptical, but became a convert. The hummus, though somewhat different in texture, was very good and satisfying. The brown rice chips were downright addictive. More recently I tried the spicy chickpeas and they, too, were a delightful surprise. The chickpeas bring their own pleasing texture and nutty taste and the heavenly spices complement the beans as well as leave an alluring lingering taste that says, “More!” Tinky has tamed the seeming severity and harshness of her diet with some wonderful and wholly healthy snacks that are well worth incorporating even by those for whom a full-blown banana split is breakfast. Yummy !!! Definitely will try…. Flaneur, you flatteur! 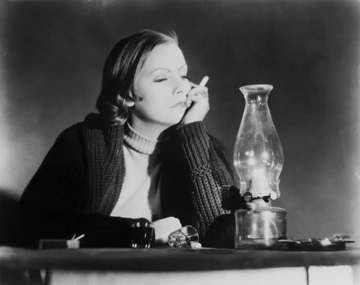 Cynthia, let me know what you think when you do…. Sharing! I know these will be delicious. Thanks for keeping this blog going. My son makes roasted chick peas for movie night for his lovely wife who can’t eat corn or gluten. He urged me to try them and he was right! Fabulous with different spices. I need to try your hummus tho. Oddly, I hamve both tahini and almond butter in the pantry. I just happened to soak some chick pea overnight and just finished cooking them. Seems like kismet! Thank you, Elizabeth. And Grad, I’m impressed at your forethought. As I mentioned on the air, it’s hard for me to think ahead to soaking and cooking!